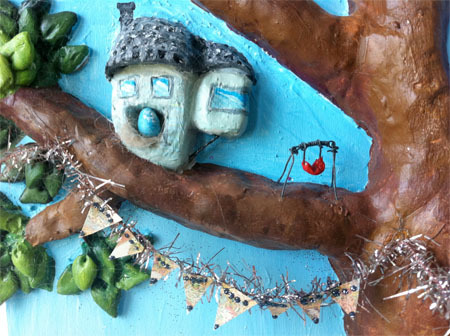 A little while back, I took part in a mixed media art challenge that was… well, a challenge! 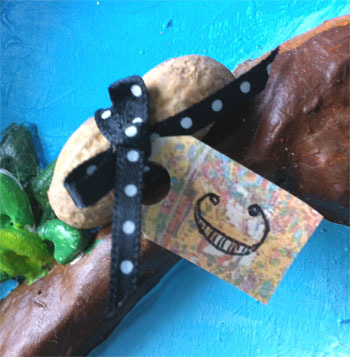 You had to make a mixed media piece using 25 items from a list of predetermined items decided in advance. You were allowed to omit 2 items and use as much glue, wood, paint etc as you want. The letter C. The actual letter C and not something that starts with “C”. A nut – Organic or not, the choice is yours! 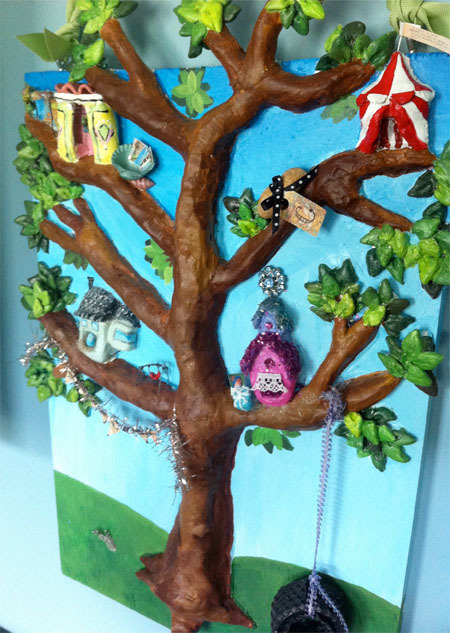 So, I decided to make a piece I call “Neighborhood Watch” with four birdhouses in a large tree. I was obsessed with tree houses as a kid and pretty much drew at least one a day for a year or two, so this piece reminds me of all those multiple little drawings. Although each bird house would have been a people house (physics schmysics). First, we have the Miami Beach/Palm Springs house. 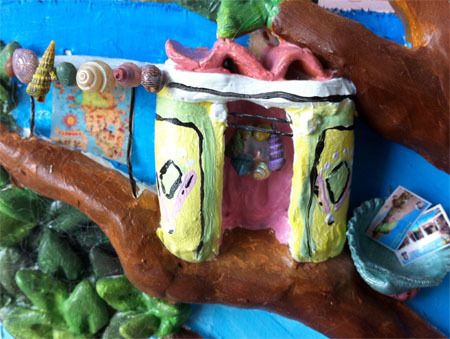 It has an art deco theme with pastel colors, a wavy “tile” roof, a little outdoor covered area and a shell out front to collect mail. It boasts one and a half square inches and has an open floor plan! 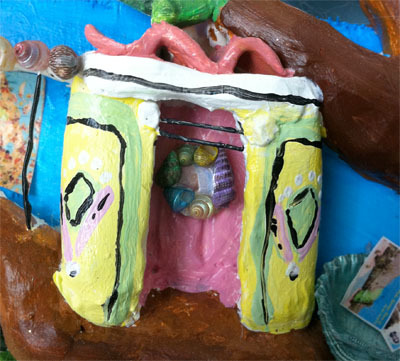 Inside the little dwelling is a tiny round mirror that I carefully glued tiny shells around. 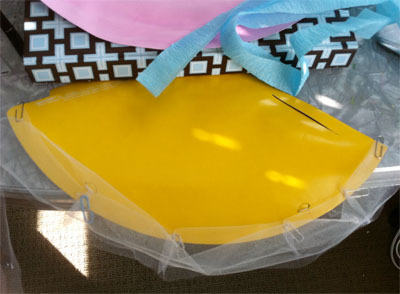 That covered the mirror and shell requirements. 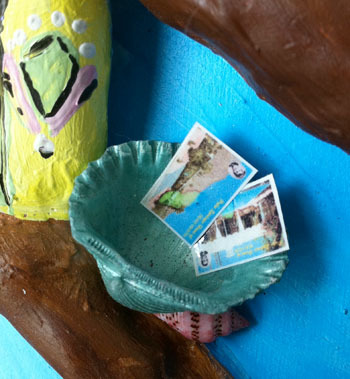 The little shell mail box has two postcards inside. They are both tiny copies of postcards of famous people and their homes in Palm Springs. This shows Bob Hope and Dean Martin’s houses. 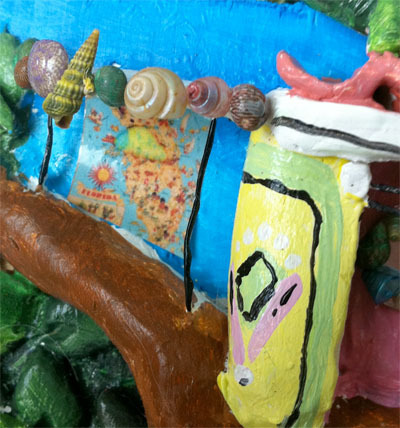 The little covered deck has shells around the top awning area and a colorful tiny map of Florida in the background. Next, I made a little circus tent. The top of the tent has a little flag that was made from a copy of a dictionary page. I picked the definition for “happy” and “harpoon” just sort of sneaked its way in. 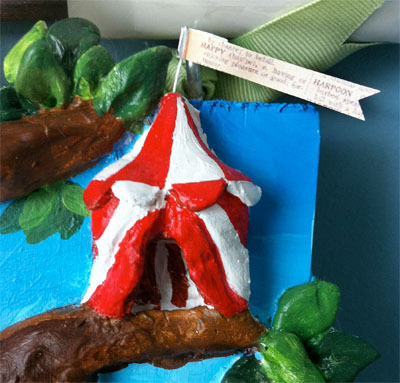 To the left of the circus tent is a little peanut with a gift tag that has a “C”. I had the idea that the bird living here was keeping the peanut as a gift for an elephant friend of his. This covered the nut and “C” requirements. It also covered the map requirement because that tag is a map of Disneyland! 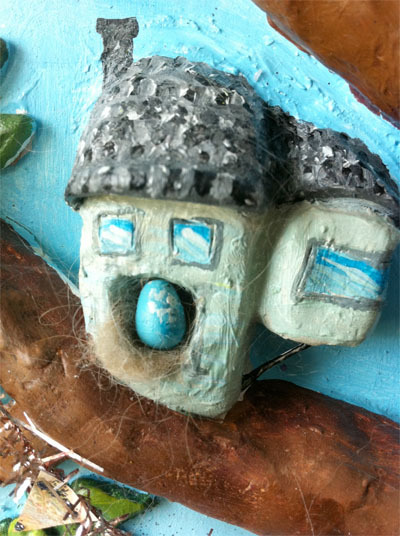 Then, here’s the little family house with the addition and little swing which I made out of wire and sculpey. That was not easy to assemble! The nest the little egg is sitting on is made out of Meg, our golden retriever’s, fur. That covered the “lock of hair” requirement! The last house is the Starlet’s house. 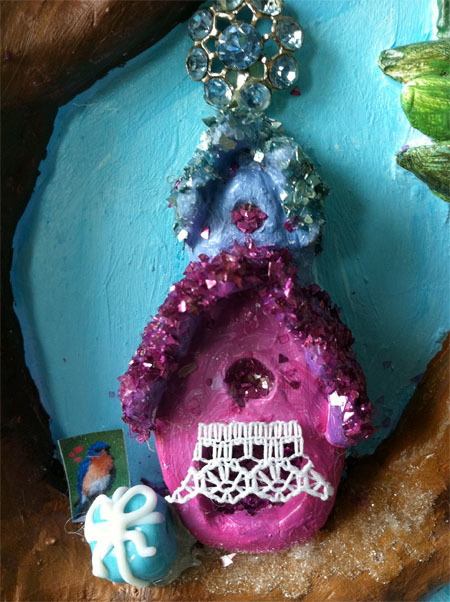 She has a two story house with a lace awning and glass glittered roof “shingles”. Pretty fancy. There’s a rhinestone decoration on the top of the house, too. There’s a picture of her little blue bird boyfriend in the front, and it looks like he left her a little Tiffany box by her front door. The Tiffany box is a glass bead, which covered the glass requirement. The lace awning covered the lace requirement, the glittered additions covered the glitter requirement, the rhinestone piece covered the broken jewelry requirement and the bird portrait covered the photo requirement. The glitter seen here is shard glass glitter from Art Institute glitter. I used Alexandrite and Blue Topaz . 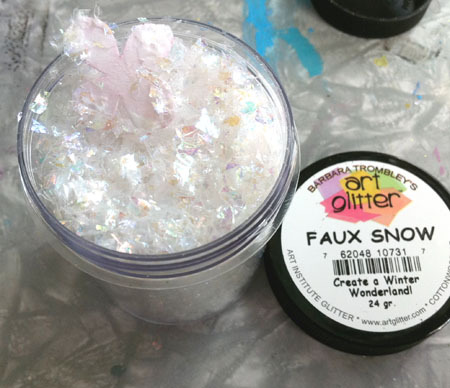 I love vintage glass glitter, it looks so fancy! 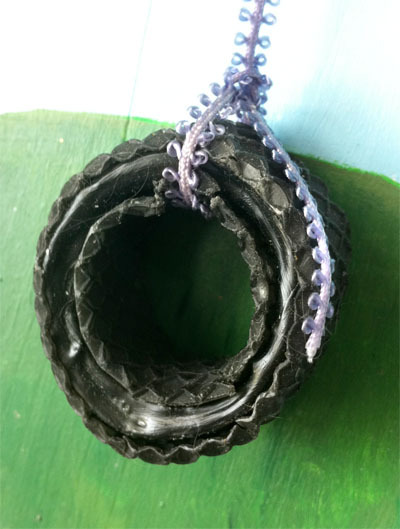 At the bottom right, there’s a little tiny tire swing made out of a toilet paper roll and covered in black beeswax. That covered two requirements. 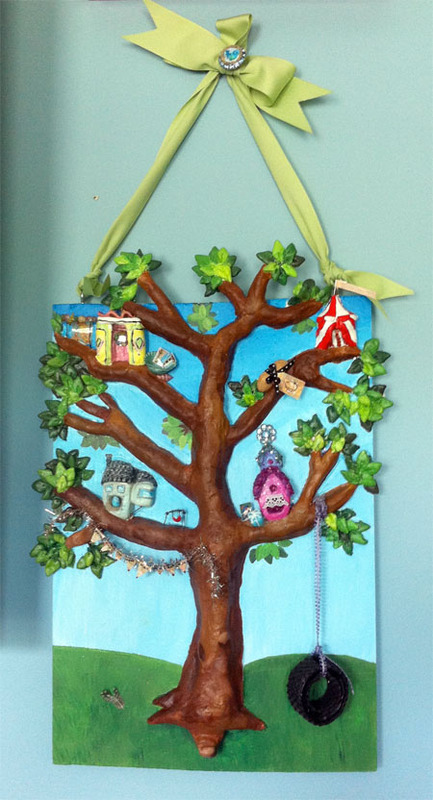 It hung in the gallery at Artist Alley in Southern Pines, NC for about a month and now it’s home with me! I really enjoyed this challenge… keeps your assembly items shopping list in check! 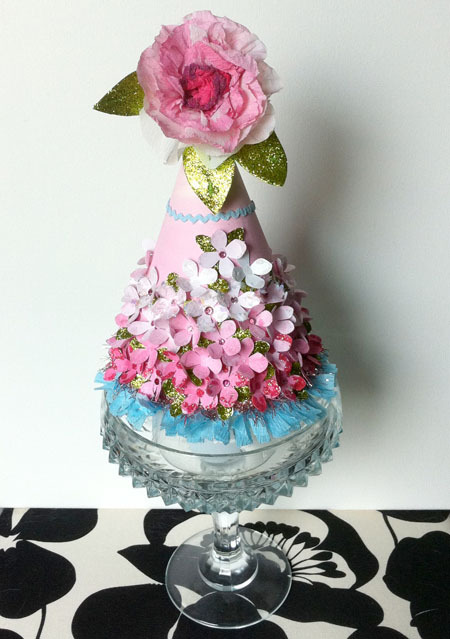 Today, I’m going to make a pink, blue and green party hat! Okay, to start, you’ll need to take that party hat, undo it, make it flat and trace it, color side up, on a piece of white card stock. 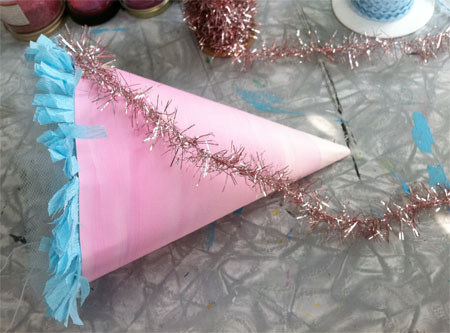 I then painted that party hat template pink. Darker pink on the bottom to a lighter pink on top. 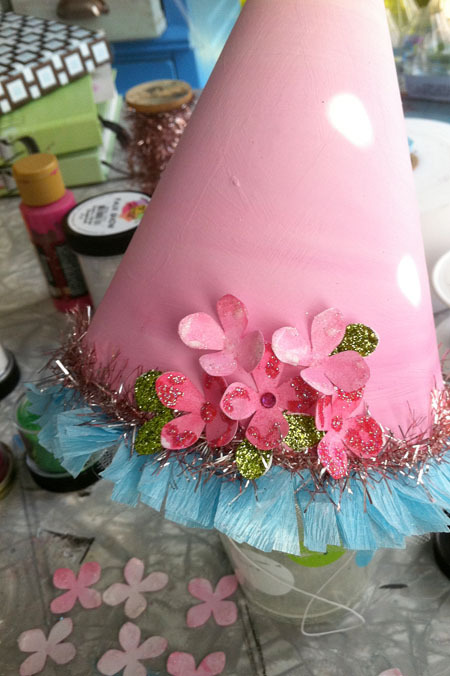 While that paint dries, I took some white tulle and crepe paper and hot glued it on the bottom of the hat. 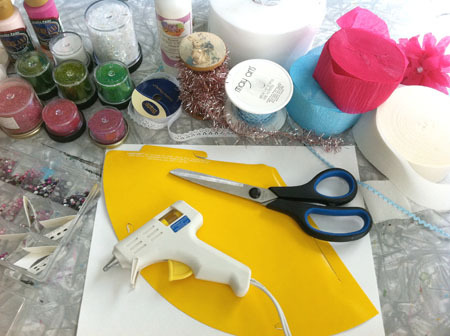 The tulle is unruly, but it’s okay to make a mess since the painted template will go over it and hide the mess! 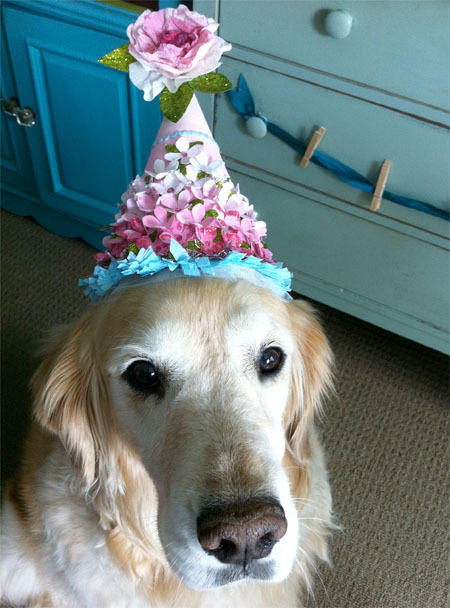 So, I skipped a lot of steps here, but if you’d like to see the missing steps, I made a similar party hat a few weeks ago, click here to see it! So, after I put on the tulle, the crepe paper, fringed up the crepe paper, glued on the pink painted template piece, I hot glued on this pink vintage tinsel. Know what also is unruly? 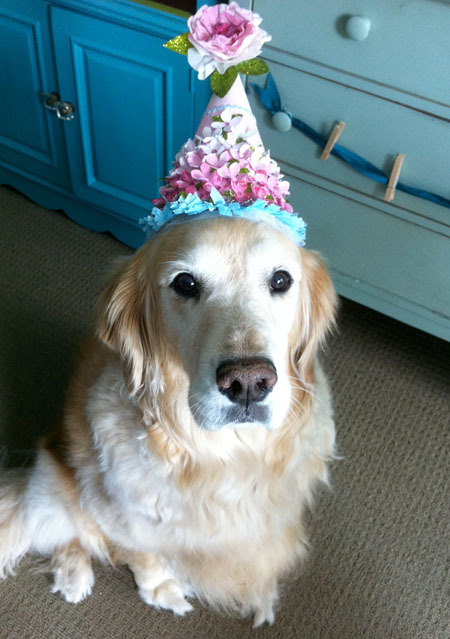 A party hat that has been de-coned. 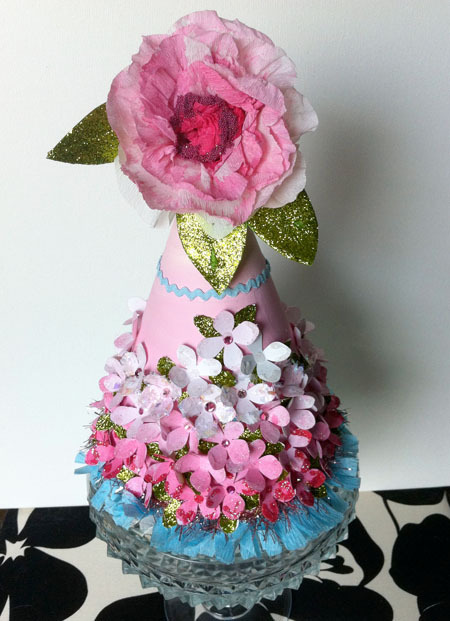 I used a heavy book to keep it flat while I added the tulle and crepe paper. 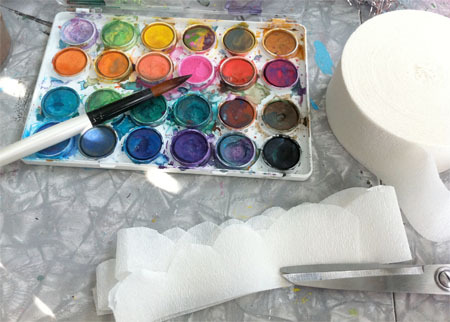 Now we’re going to play with watercolors. First, I’ll get the top flower done. I cut out a strip of the white crepe paper. About 4 ft. long. I then accordion folded it and cut scallops out along one side. I then painted it (this makes a mess! But watercolors clean up easily!). I left about 1 1/2′ white, then next section I did a light pink and then got progressively darker with the pink by adding red and a hint of purple. I hung this up and let it dry thoroughly. Here’s what it looks like when I was finished. It doesn’t have to be even close to perfect. Have fun with it! 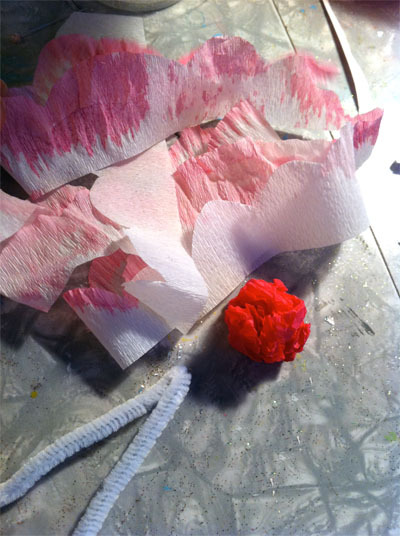 While the painted crepe paper is drying, I punched out a bunch of little flower petals. I did as much as an 8 1/2″ x 11″ white piece of card stock could yield. I set about 12 petals aside to become leaves. 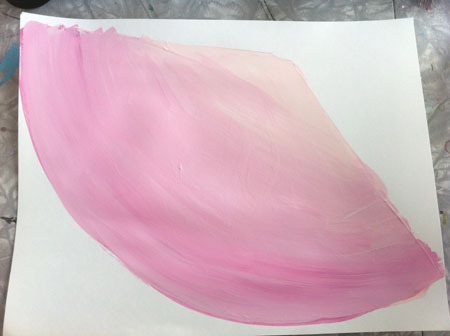 I then painted the rest of the petals with watercolors. Some were super light pink and others were darker pinky-red. 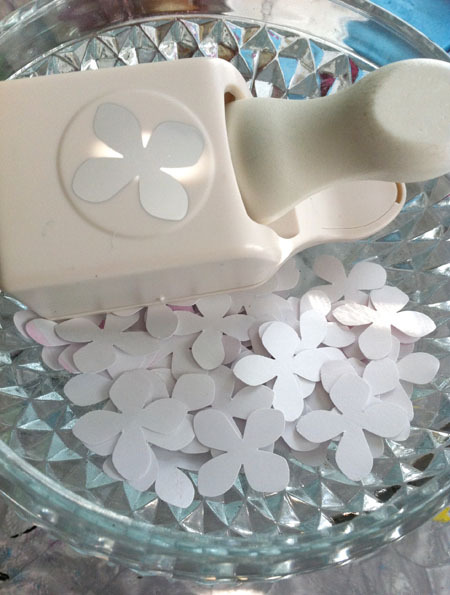 As the petals dry, I started glittering up my leaves. 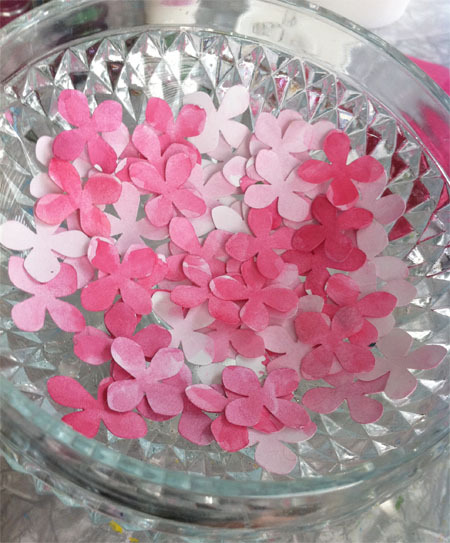 I covered the white petals in glue and dunked them into the glitter and let it dry. 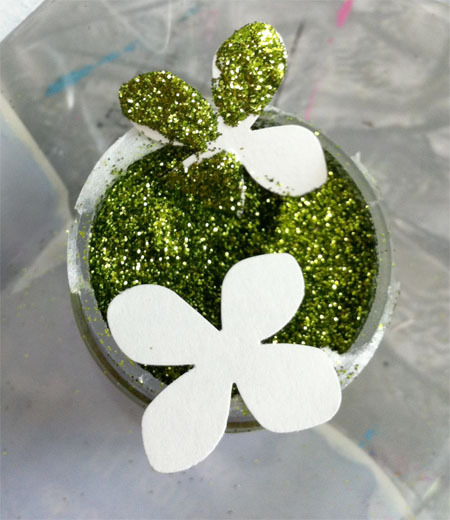 I used the #358 Jungle green glitter listed above. 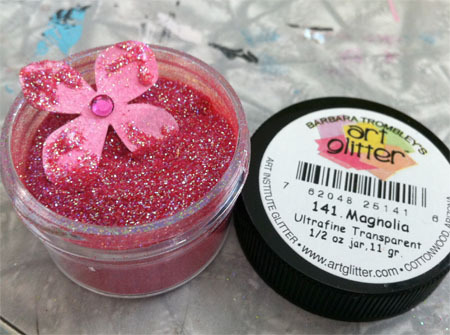 Some got that bright pink #141 Magnolia glitter. The rest got clear #89 Martini glitter. 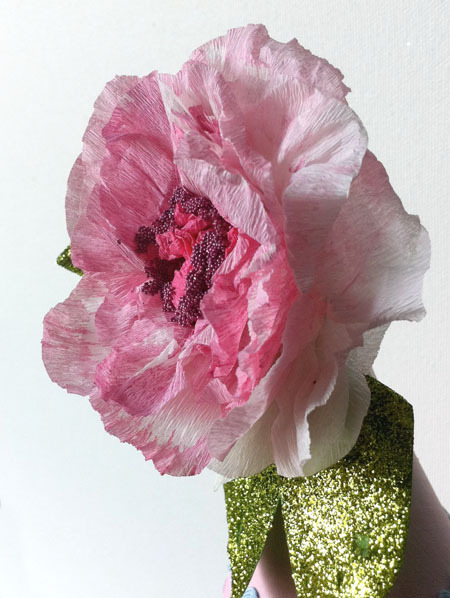 I then started putting the hat together by gluing the petals and leaves on one by one using the Designer Dries Clear Art Institute glue. Some of the leaves were cut in half, but most were cut into fours. For the top of the hat, I balled up a piece of magenta crepe paper, a little bit bigger than the size of a marble and hot glued that to a folded piece of pipe cleaner. 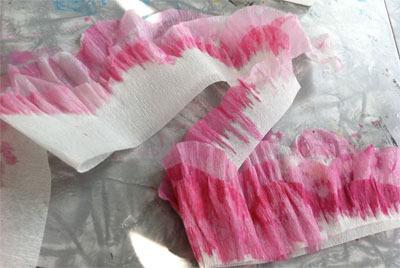 Then, starting with the darker side of the crepe paper, I glued that to the inside magenta ball. I turned and glued, turned and glued. 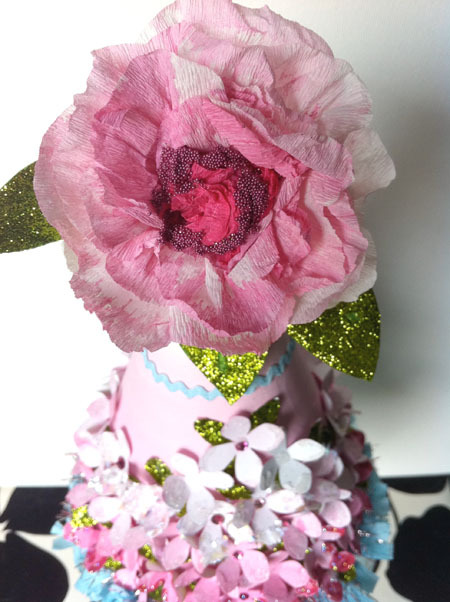 I added leaves to my crepe paper flower and hot glued it to the top of the hat with the pipe cleaner going into the little hole at the top of the hat. 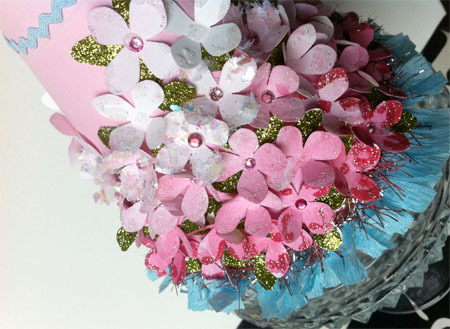 I also glued on some of those fun small glass beads #806 Sonata in the middle of the flower to give it some fun texture. 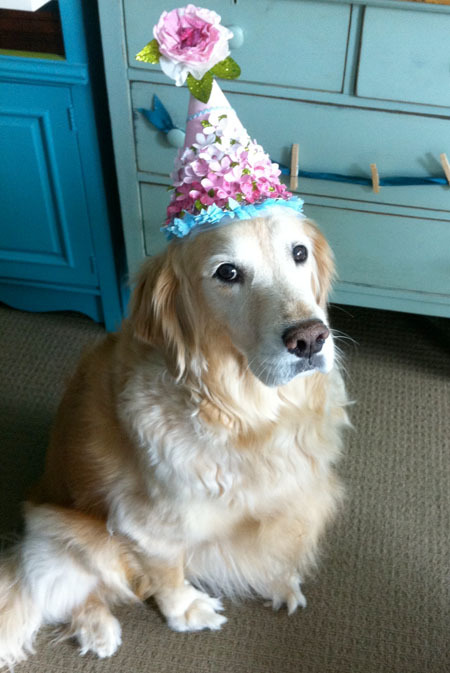 My dog, Nutmeg, was kind enough to model this for us… isn’t she adorable?